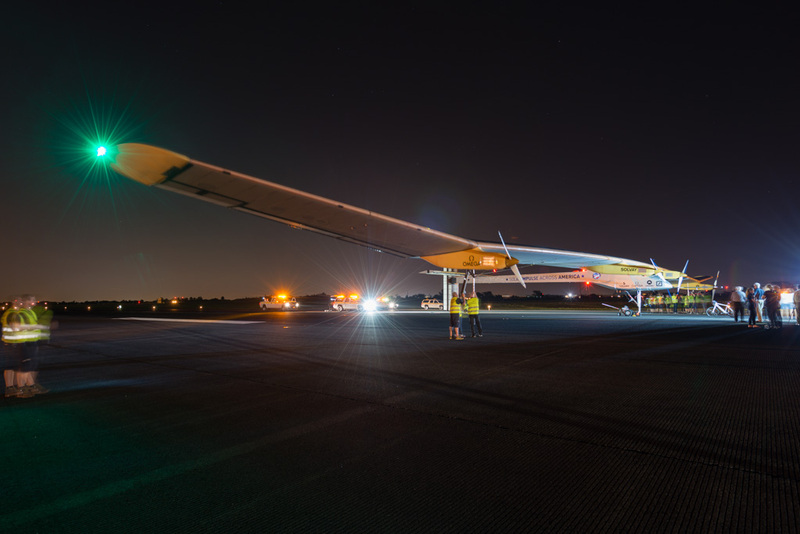 I have been tracking the Solar Impulse flight across the United States for quite a while now, and when word finally came down on the date and time of the landing at New York, I was excited. 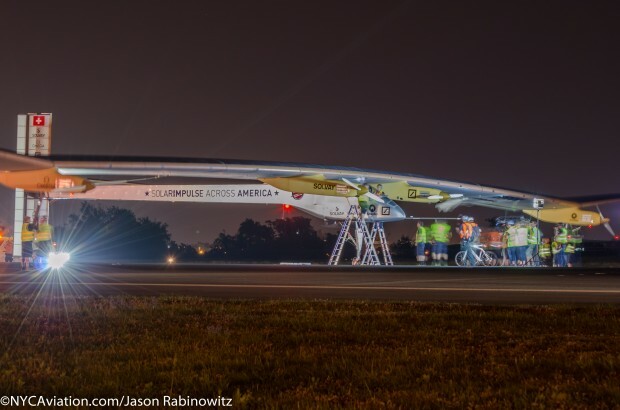 Not much keeps me up at 3am, but the chance to see a totally solar powered aircraft was most certainly one of those things. 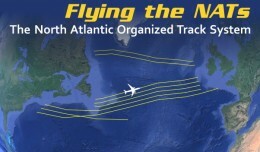 As soon as the date and time was announced, I signed up for a chance to win access at JFK to see the aircraft land, not knowing if I would have media access. Amazingly, I did indeed win access to witness the landing up close. Additionally, NYCA received media access, so I was all set to see history be made at JFK. 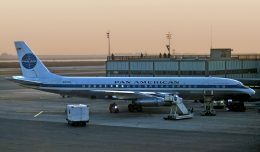 After setting up a teaser article on NYCA, I went out to JFK for a full day of plane spotting in advance of the 2am landing. 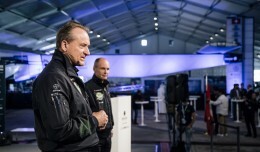 The day was interrupted by the tragic events in San Francisco, and I went back into full news coverage mode and Solar Impulse took a back seat for a few hours. 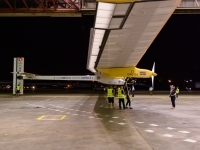 Once the news started to slow on Asiana 214, I checked in on the Solar Impulse flight, only to find that they had encountered some sort of unknown issue, and that we should standby for an update. 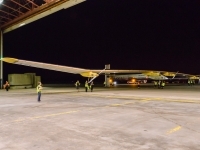 Soon enough, we learned that there was a tear in the fabric that makes up the wing, and the landing would be pushed up to 11pm. Later that night, I worked my way through the back roads of JFK to hangar 19, which is in an area of the airport I had never visited before. For those of you that may have flown on Tower Air before, hangar 19 is behind that old terminal. (Quick side note, the Tower Air terminal, or at least the exterior, looks like it was shut down yesterday. All signage is still on the exterior of the building!). 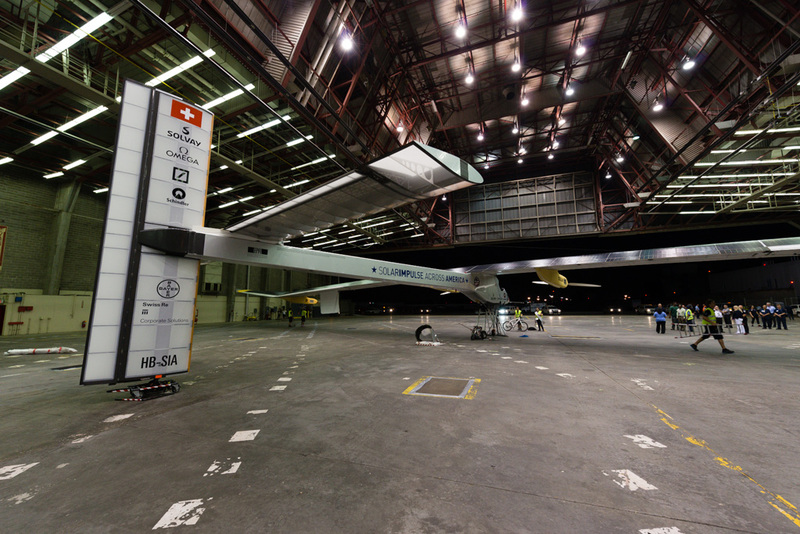 After checking in with the Solar Impulse crew, we stood inside the absolutely massive hangar 19 and awaited our instructions for the landing. 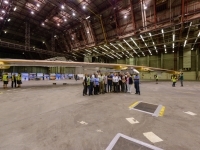 Fellow NYCA attendee Manny Gonzalez inquired which runway Solar Impulse would land on, and we were informed it would be 22L. 22L is the furthest runway from hangar 19, so our bus ride out to the runway took quite a while. 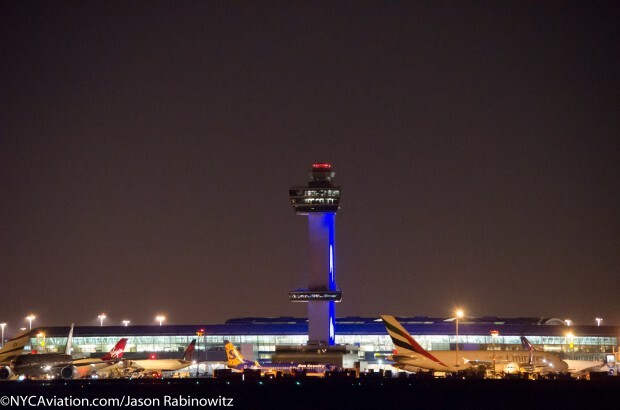 Snaking along utility roads and taxiways in the darkness at JFK was quite an experience. Taxiing aircraft were just feet away, blinding us with their landing lights as we slowly passed by. Finally out along the side of 22L/4R, I started to set up my tripod and camera. At the same time, aircraft were landing on runway 22R just behind us, one flight even went around. After quickly setting up and adjusting the settings on my camera, the event was on! 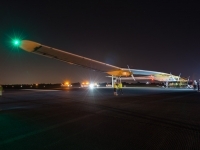 Solar Impulse normally looks more like a UFO than an airplane, with many high intensity lights along the wings. Today, however, the aircraft only had its main landing lights on, making it a bit harder to capture on video. 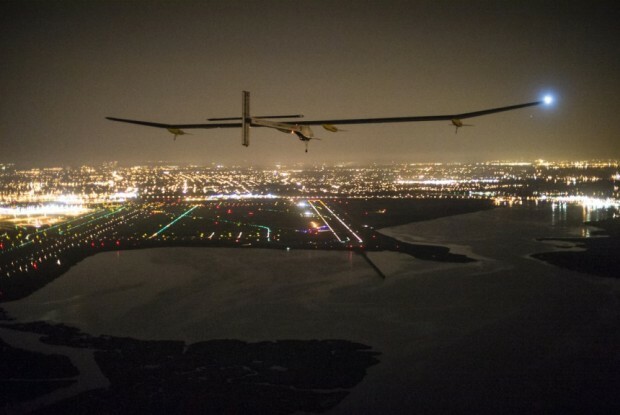 We expected Solar Impulse to approach from the north on runway 22L, which we were situated at the end of. 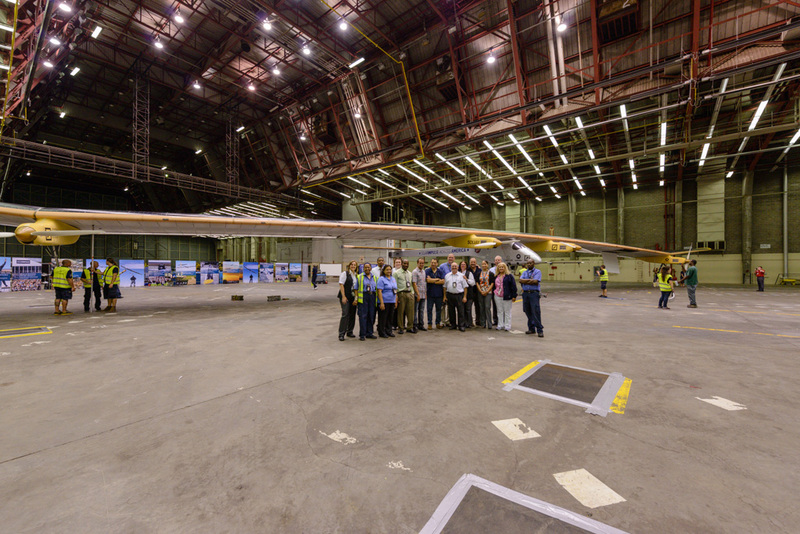 To our surprise, Solar Impulse appeared almost directly over our heads, moving north! 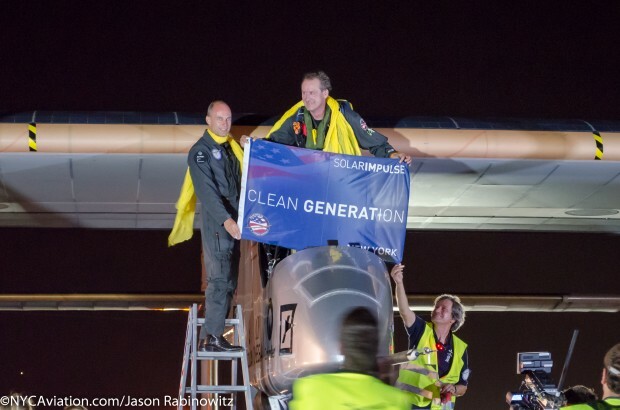 The Solar Impulse aircraft and chase helicopter crept up behind us, and I quickly turned my camera around and hit record. 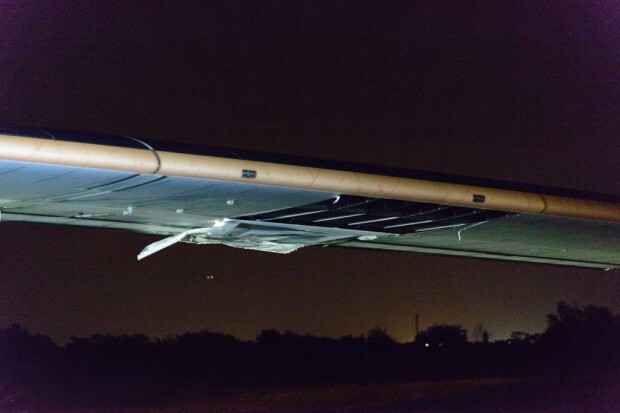 Eventually, Solar Impulse reached the end of runway 4R, and made a slow 180 degree turn to line up with runway 22L. It was almost like a visual approach to runway 4R, circle to land 22L. 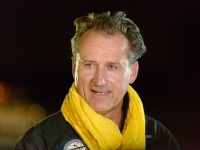 After a few minutes of checking the aircraft, including the damage to the wing sustained in flight, the pilots (who alternate between flights) gave a brief interview, overflowing with joy at the feat they just accomplished. 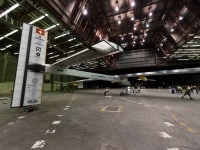 “It was supposed to be the shortest and easiest leg. 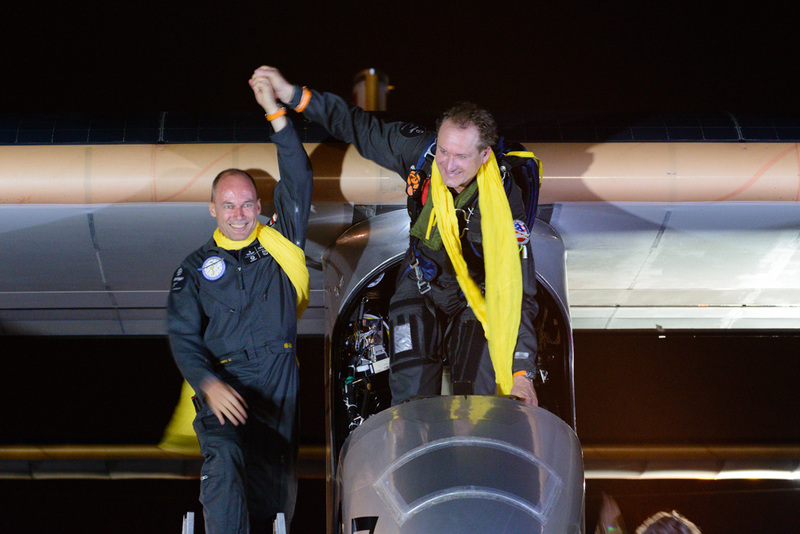 It has been the most difficult one, and it shows the unpredictability and adventure in everything we do,” said co-creator Bertrand Piccard. 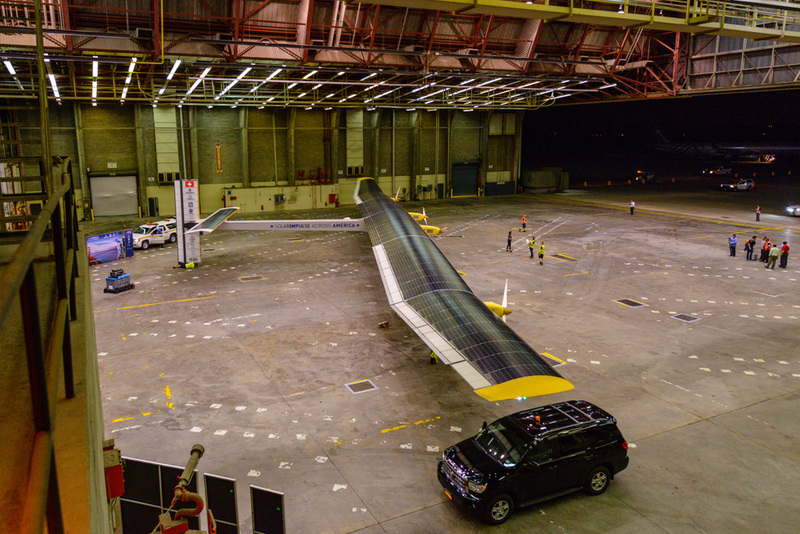 “But beyond this, what is really interesting…the goal was to demonstrate the reliability, the efficiency of of renewable energy, and this is a full success. The only thing that failed on the plane was a piece of fabric on the wing,” added Piccard. Just like that, it was over and time to head back to the hangar. Solar Impulse, however, does not move any faster on the ground than it moves in the air. 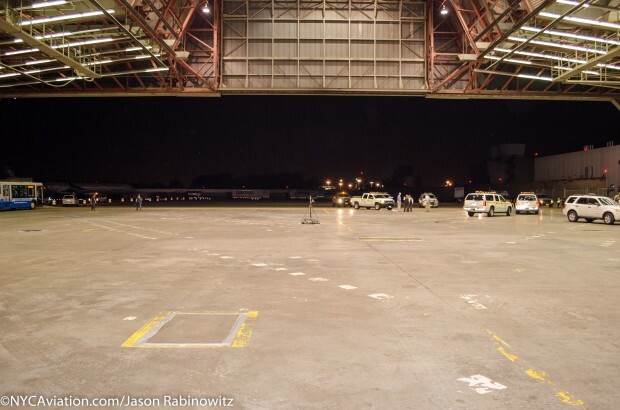 It would take nearly two hours to reach hangar 19, powered only by crew members pushing it. 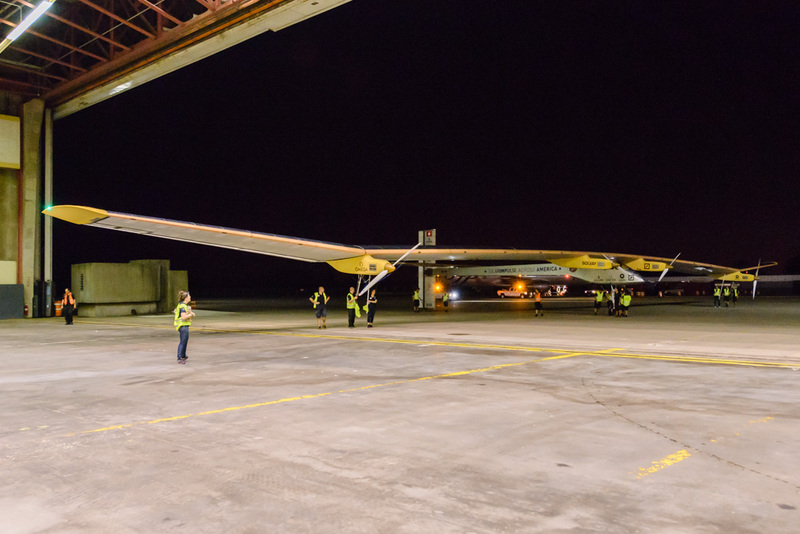 Watching Solar Impulse land up close was an amazing experience, and I am incredibly thankful I had the opportunity to see it. 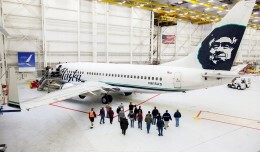 Moving forward, this aircraft may never fly again. 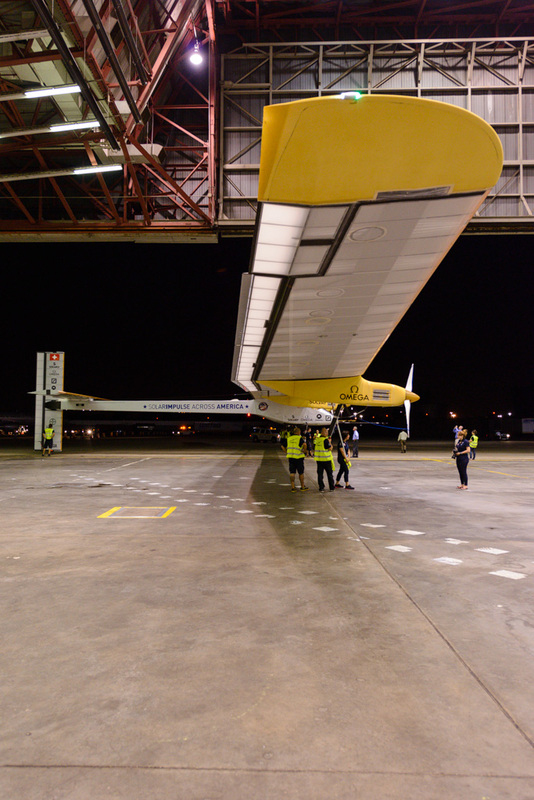 The lessons learned up to this point will be applied to a new aircraft, which will eventually fly around the globe.